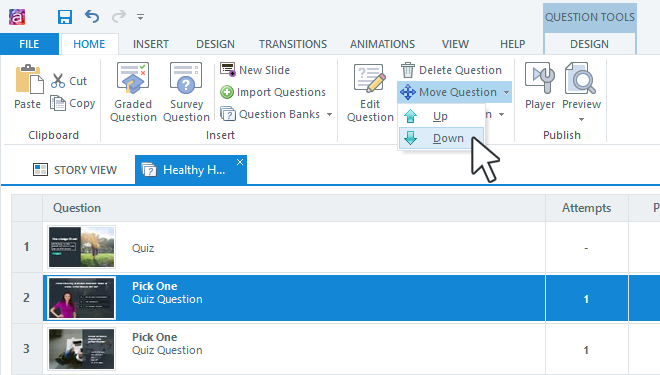 Tip: To learn how to draw slides from a question bank into your Articulate Storyline course, see this tutorial. In Story View, go to the Home tab on the ribbon. Click Question Banks and select the name of the question bank you want to edit. 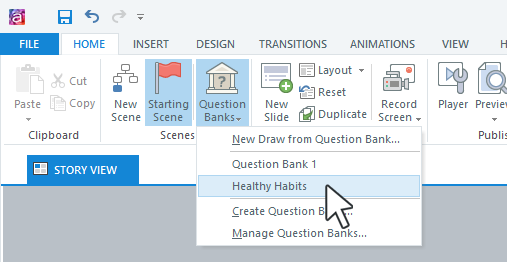 To add slides to an open question bank, go to the Home tab on the ribbon and click any of the options described below. Graded Question: Click this option to add a graded form-based question. Survey Question: Click this option to add an ungraded form-based question. New Slide: Although question banks generally contain question slides, you can also add non-question slides. 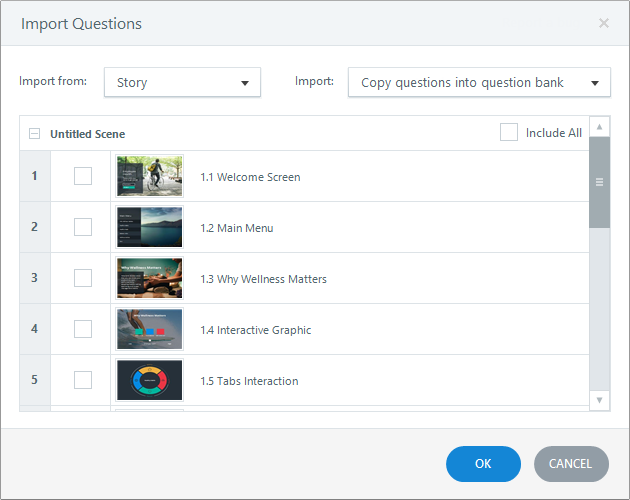 Click New Slide to add a slide from a template, a basic layout, a freeform interaction, a PowerPoint presentation, an Articulate Quizmaker quiz, an Articulate Engage interaction, or even another Storyline project. See this tutorial for details. Import Questions: Click this option to import slides from other question banks or scenes in the same project. Use the clipboard options on the Home tab to Cut, Copy, and Paste slides in your question bank. You can even use the clipboard options to copy slides from scenes in your project to your question bank and vice versa. To duplicate a slide, right-click it and choose Duplicate Question, or just press Ctrl+D. To delete a slide, press the Delete key on your keyboard or click Delete Question on the Home tab. To edit a question, just double-click it to open it in Slide View. You can change the slide design and adjust the question properties. See Working with the Question Editor for details. You can also open a question for editing by going to the Home tab on the ribbon and clicking Edit Question. The easiest way to rearrange slides in a question bank is to simply drag them with your mouse to a new location. Another way to reorder slides is to go the Home tab on the ribbon, click Move Question, then choose Up or Down. Locking slides affects how they're randomized and drawn into your course. For example, you might lock a slide to the top of your question bank so it'll appear first in your quiz—even if you randomize your question draw. 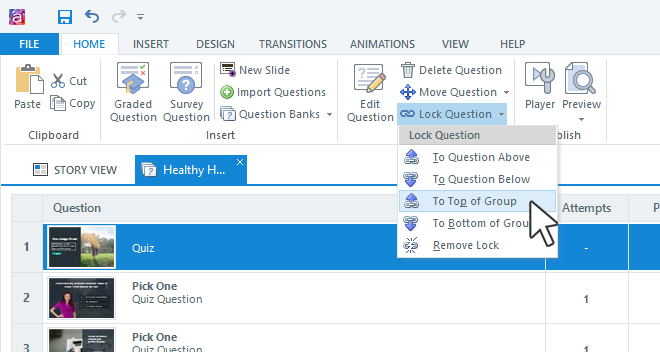 To lock a question, go to the Home tab on the ribbon, click Lock Question, and choose one of the locking options. You can lock a slide to the question immediately above/below it or to the top/bottom of the question bank. If you change your mind, you can remove the lock. 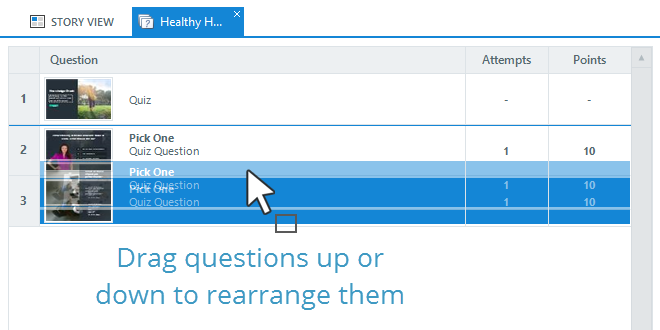 You can also manage your triggers and variables while working in a question bank. Just use the Triggers panel on the right side of the screen. 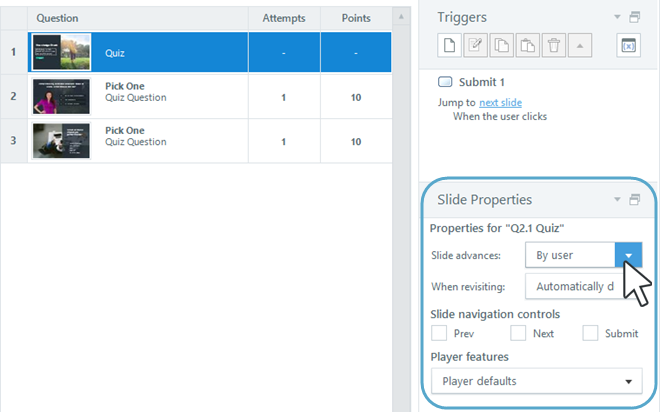 Manage the properties of your question bank slides—such as how they advance and which navigation controls they have—using the Slide Properties panel in the lower right corner of the screen. Learn more about slide properties.